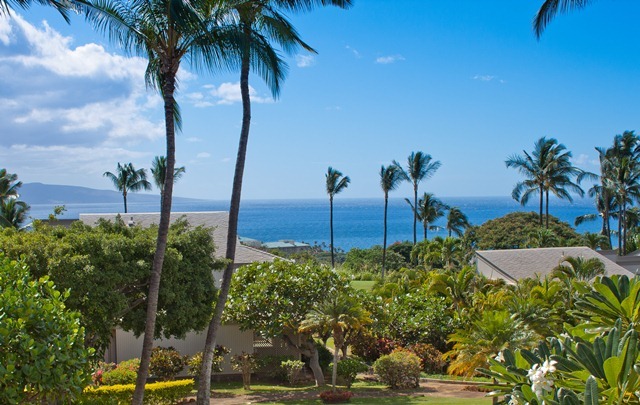 WAILEA EKOLU ~ Direct Ocean Views! This unit has a great layout with direct views from your living room, kitchen, master bedroom and lanai. An upstairs corner 2 bedroom, 2 bath unit with extra windows and high cathedral ceilings. Open, expansive and comfortably relaxing. Tastefully upgraded over the years and there’s even a built-in wine cooler for your favorite red or white wine. This can accommodate the family for the holidays and your vacation retreat! When you need an extra bed beside the queen and two twins, just pull out the queen sleeper in the living room for a full family experience! This is one of the best view units on the market with great rental history. Offered at $859K.